With the rapid increase of wireless technology, devices and services, more companies and their hardware are competing for a limited amount of available resources across the radio frequency spectrum. This is an issue that School of Information Studies (iSchool) associate professor Carlos Caicedo has been researching along with a working group from the Dynamic Spectrum Access Networks Standardization Committee (DySPAN-SC) of the Institute of Electrical and Electronics Engineers (IEEE). 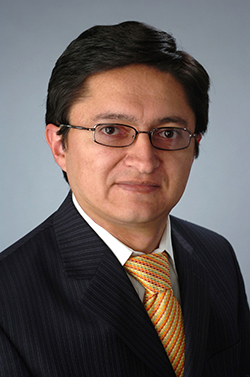 In 2014, Caicedo was the recipient of a grant from Google to explore and develop a tool that would elaborate and evaluate wireless spectrum consumption models as defined by the IEEE 1900.5.2 standard, and provide spectrum managers with data needed to determine compatibility of spectrum use between different wireless systems and devices. Caicedo, along with graduate student Arnav Mohan from the College of Engineering and Computer Science, developed a software solution that helps spectrum managers and radio engineers build spectrum consumption models for their devices and determine spectrum use compatibility between multiple systems in a given area. The code for the tool, called Spectrum Consumption Model Builder and Analysis Tool (SCMBAT), has now been released, and Caicedo hopes that the use of the tool will help spectrum managers understand when wireless systems will interfere with one another and identify spectrum sharing opportunities. The tool allows radio frequency managers to develop spectrum consumption models, and by exchanging these models with others, they can then determine how wireless spectrum use and interference would factor into the provision and/or use of wireless services in a given area. The SCMBAT tool is available for download on GitHub under an open source license.